Hiking trails in the Aude Cathar Country France. A near your campsite, for nature lovers, you will find various trails suitable for all levels, including the famous Cathar Trail. 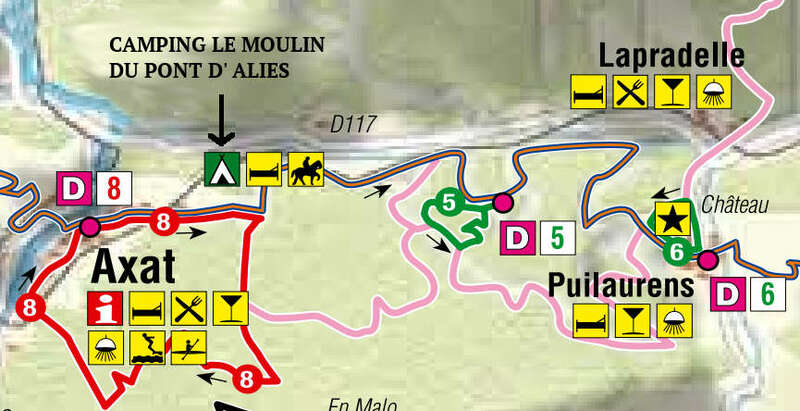 Maps are available for download further down the page or at the tourist office: La Maison des Pyrenees Cathar Country adjacent to the campsite Le Moulin du Pont d’Alies (MPA). Here is our selection by OTC difficulty. Interactive, interpretive trail of the Aude forest offers 8 educational spots on different topics related to wildlife and forest flora. Ideal for the family! From Puilaurens , along the D22 or the castle car park , the route connects the castle to the village in an easy loop with a low altitude. Starting Axat , Place J. Platform ( the new bridge , right) . This pretty sporting career , yet affordable , makes you discover the end of the gorges of Saint George, the forest Fontanilles with remarkable views on Axat and line historic railroad red train. 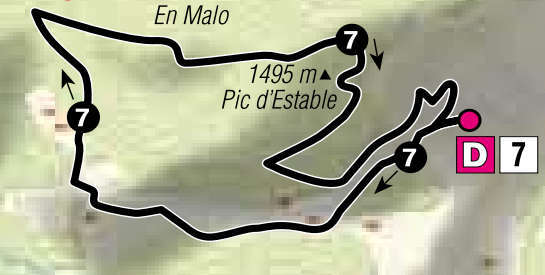 Start: Caunil, parking in the hairpin turn or parking the neck of the Frayche, at the playground. An ideal course for the diversity of landscapes and observing raptors (chamois). Departure : above the village of Belvianes in the parking lot of the church. You have a unique view on the throats of Pierre -Lys (spot rafting and climbing) and on the Walls of the Devil. In these formerly impassable gorges recently , the priest Félix Armand dug a path in the rock … to pick! Do you find ? Depart: above the village of Belvianes in the parking lot of the church. This tour , which begins with the gazebo on the board Nébias , Puivert , offers a view overlooking the Circus Quillan , from the viewpoint of Roc Capio 650 m. You walk through the olive grove Ginoles and ” capitelles ” the shepherds’ huts . A high trail colors! A path that will take you to 1730 m of altitude, neck Seillis , where you can admire the raptors and whistling marmots . Continuing to climb, summit Ourtiset , you have a breathtaking view of the Pyrenees , Pays de Sault and if the weather is clear you will see the Plain of Carcassone and The Black Mountain . In return , a journey with flowered gentians , woody and fruity through the forest on the trail of Tourrugue lined with wild raspberry and strawberry . A rich and varied circuit. Throughout the climb , you have a view overlooking the valley of the Aude. After Bergerie , you arrive near the Gourg , a small lake where flocks are drinking . You are at 1500 m altitude. Then you go to the track the neck of the Tourrugue where you admire the Ourtiset (1934 m) and the Pic de Madres ( 2469 m). The descent is steep and on Campagna winds between hazel . Tonic and invigorating journey for the body and mind! 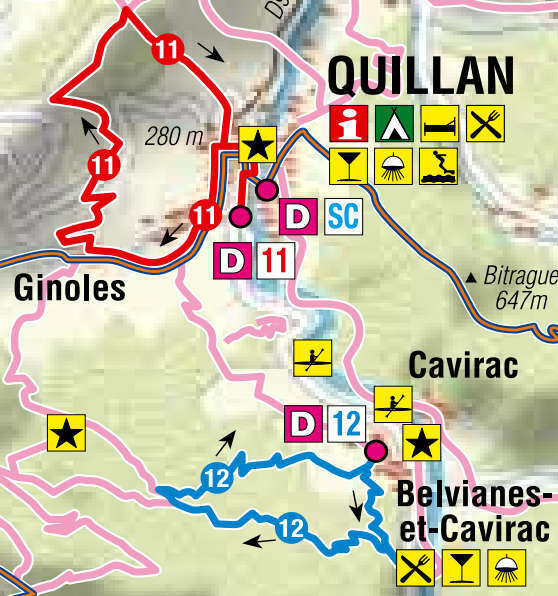 Download map of all the trails in Cathar country by clicking here .